HCM City (VNS/VNA) - A selection of artworks by Vietnam’s most exciting talents will be available for sale at the Vietnam’s only affordable art fair, Art For You. Organised by Manzi Art Space and Work Room Four, the annual fair returns with the participation of more than 200 visual artists working and living in Vietnam. The fair, which will be in its 10th and 11th edition, will take place in Ho Chi Minh City from March 28 to April 1, and in Hanoi from April 11 to 15. A collection of more than 500 works including sketches, photographs, illustrations, paintings and sculptures will be on display. A line-up of vibrant and talented contemporary practitioners in Vietnam, including Nguyen The Son, Nguyen Minh Thanh, Le Cong Thanh, Truong Cong Tung, Tran Trong Vu, Le Quy Tong and many others, will take part. According to Tram Vu, founder of Manzi Art Space and initiator of Art For You, the event is not only a place to discover something beautiful and engaging and give it a home, but also a way to support creative local artists. “Our objective is always to exhibit, promote and sell high quality artwork made by artists living and working in Vietnam to a diverse audience at an attractive price point in an environment that is refreshing, contemporary and welcoming,” she said. For Camilla Bjelkas, a cultural officer of Swedish Embassy in Hanoi, Art For You has been a door to the city’s contemporary art scene. 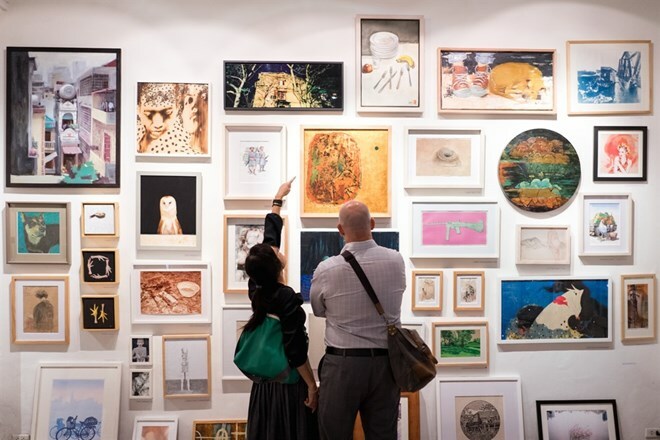 American curator Suzanne Lecht, who has been living in Hanoi for more than 20 years, said the fair is a wonderful contribution to the arts community. “By presenting a wide variety of artwork by many different artists, some well-known, some to be discovered, they appeal to a wide market of tastes," she said. At the fair, artists can exhibit and sell their work and connect with audiences. Visitors can enjoy a selection of artwork all in one place.